My latest book Weathered: Cultures of Climate is published tomorrow (17 November) by Sage. Here, I offer a heavily abridged version of the final chapter of the book, ‘The future of climate’. Cultural theorist Arjun Appadurai has argued that humans can only know the future culturally, that the future is a ‘cultural fact’. Consequently, and inevitably, there are many possible futures; and it follows too that there are many possible climate futures. Scientists and prophets might offer their predictions of future climate but, given that the future always recedes ahead of us, today’s predictions will always be supplanted by those of tomorrow. Today’s climate is always yesterday’s future climate as predicted by past prophets. For Appadurai, how people imagine the future reveals a lot about their political beliefs and their cultural practices of the present and past. And this is as true for the climatic future as it is for other futures, whether economic, technological, social, medical. Imagined or predicted climates of the future might evoke emotions of fear, loss and nostalgia through dystopic accounts, but they might also have the potential to engender faith in human capabilities to bring about a better or a more just future. As I have shown in previous chapters, attempts to govern climate become battlegrounds upon which different political visions of the ‘well-ordered society’ or the ‘good life’ vie for supremacy. Here, in this final chapter, I engage with some of the ways in which future climates are being imagined at the present time. I suggest three patterns identifiable in these imaginative worlds. The desire to re-secure future climate is one and the recognition that future climate will always be in a state of improvisation is another. But there is also a third possibility: that in the era of the Anthropocene the very idea of climate as a useful ordering device for humanity is now moot. People’s engagement with the idea of climate has always had physical and psychological dimensions. A disturbance to the stability of physical climate, whether real or perceived, has a disconcerting effect on the human sense of security and well-being, both materially and emotionally. Any disaster changes the lifeworld of an individual, but when a series of climatic disasters are strung together so that they tell of ‘a change in the climate’ the feelings of loss and estrangement are all the more powerful. Explanations for such unsettling of the natural orders people construct for themselves are frequently sought in the realm of human behaviour. Climate instability has long functioned–from the myth of Noah’s Flood onwards–both as a sign of, and a warning against, human misdemeanours. The realisation of a change in climate has often been seen as a moment for moral cleansing or personal transformation, captured by the Greek word Kairos–meaning the right or opportune moment. One of the lessons Oreskes and Conway sought to convey in their morality tale about the climatic future was that in order to prevent a radical de-stabilising of the world’s climate, people of today’s generation should change their ways. The American fantasy drama television series Game of Thrones (GOT) illustrates another way in which an impending change in climate works metaphorically as existential threat and as a call to repentance and change. The zombie-like White Walkers are harbingers of a devastating winter climate, confronted only by the Night Watch, black-clad warriors who seek to convince the residents of King’s Landing of this imminent climatic threat. In GOT climatic change functions as a metaphorical but perpetual danger, the risks of which—disrupted agriculture and food supplies, personal discomfort—threaten the stability and survival of the political order. In commenting on the active bloggers who engage with the TV series, Manjana Milkoreit argues for the crossover between winter in Westeros and how the threat of a deteriorating climate future functions in the real world. Winter is coming, but few in Westeros seems to believe it; the world is warming, but American politicians are divided or apathetic. The aim of these morality tales, whether Oreskes and Conway’s fictional history or Game of Thrones, or indeed today’s goals in tackling climate-change, is to re-secure climate through some combination of governmental, technological, social or personal transformation. For example, through the collective effort of nations, the Paris Agreement on Climate Change seeks to stabilise climate at no more than between 2 and 1.5 degrees C warmer than the pre-industrial level; or as summarised by the journal Nature, “… a global deal to secure a safe ecological future for all”. The discourse of climate engineering points rather to novel technologies which might re-balance planetary flows of energy and carbon to deliver a stable and secure climate. Through a radical restructuring of social and economic power structures, Naomi Klein seeks to dismantle the carbon capitalism that has destabilised global climate, while scholars such as Karen O’Brien draw attention to the potential of personal transformation to contribute to a re-securing of climatic and cultural life. These instincts to re-secure climate within desirable and ‘safe’ limits, to bring climate back into some sort of orderly condition, are all recognisably human. 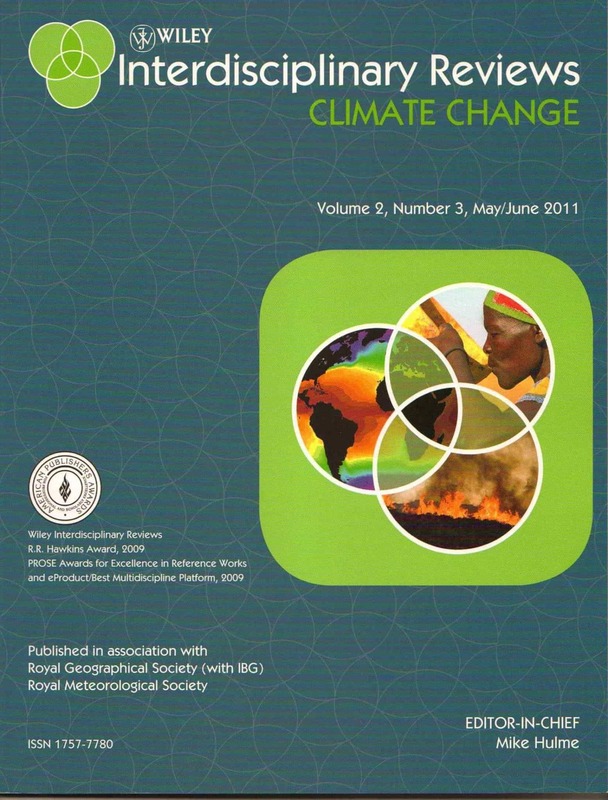 If a stable climate is deemed to be a global public good, if it has only been the benign climate of the Holocene which has allowed human civilisation to flourish, if human intrusion in the atmosphere is regarded as despoiling a natural and desirable state … if all these things are true then it may well seem logical and necessary for global climate to be rehabilitated, to prevent it from becoming too disorderly. Such impulses to re-secure and protect climate speak to the enduring human need for order and stability. Even if it were possible to live materially with the effects of a changing climate, it might not be psychologically desirable to do so. Much thinking about the future of climate is therefore driven by the desire to guard and defend climate against the perceived distorting effects of human actions; to eradicate—or at least to minimise—the ‘unnatural’ influences of humanity on climate. The instincts described above are bound-up with the value people perceive of retaining climate as an idea which restrains the human experience of weather from descending into chaos. This indeed is a powerful function of the idea of climate which, throughout this book, I have argued can be found again and again across different historical and geographical cultures. But a rather different imaginative stance with respect to the climatic future embraces the idea of improvisation, the idea of creating something unplanned and ad hoc out of materials immediately to hand. In this line of thought, a changing climate also functions symbolically, but rather than as a signifier of cultural anxiety or moral culpability, a changing climate becomes a metaphor for the spirited life and irrepressible creativity of humanity. Thinking of future climate as something that can, and will, only result from human improvisation requires starting from a different premise to that which provides the impulse to re-secure climate, to bring climate back into order. Yes, the premise for improvisation recognises the deep material traces left on the physical planet by human cultural practices. Yet the starting premise for improvisation is one which diverges from that inspiring the climatic projects of transformation mentioned in the previous section on this important additional point. Rather than being controllable through political will, technological ingenuity or moral integrity, or even through divine oversight, climate ‘improvisers’ recognise that the physical processes of the planet’s atmosphere and oceans will always escape bounded human efforts to constrain them. This twin realisation—human agency as having material force on the physical world, yet physical processes which stubbornly escape human control–sets up the tension which characterises how my putative improvisers might think of the climatic future. Future climates will not be securable in the old modernist sense of mastery, design or purposeful governance. There can be no going back to the climatic past, nor any possibility of maintaining a secure, stable or even predictable future climate through directed interventions. A natural atmosphere, whether real or imagined, can be no more; oceans are being carbonated, ice-sheets set in motion, glaciers in retreat. And yet people, collectively, are neither passive nor powerless. Given Anthropocenic possibilities, my improvisers would argue that people—as actors with global reach–cannot but take on a conscious and reflexive role in relation to the climatic future. Having dispensed with God and having re-joined nature, there remains open to people of the twenty-first century only the option of taking on an active responsibility for the coming climate. But neither scientific knowledge nor a semi-domesticated nature will allow humans to guarantee the climatic outcomes of their behaviours and technologies. In the terrestrial sphere the recent vogue for re-wilding might be seen as one expression of this ethic of improvisation: re-arranging nature from whatever spaces and species are readily available, but without a prepared masterplan or secure knowledge of the outcome. Re-wilding might enthusiastically be embraced as an attempt to recreate pre-modern ecosystems, but such an ambition can never be achieved. Contexts are different, nature does not cooperate, unforeseen side-effects occur. Improvised adjustments to local ecologies are made continuously by both non-human and human actors, the results of which are novel ecosystems and new species assemblages. So too with the atmosphere. The ambition to return the atmosphere to pre-industrial conditions, or even to re-secure a stable climate no warmer than 2 degrees C above pre-industrial, may in some ways be conceived as ‘re-wilding’ the climate. But such efforts are doomed to fail. Contexts are different, nature does not cooperate, unforeseen side-effects occur. In the Anthropocene the only possibility is the creation through improvisation of new and wholly underdetermined climatic futures. What will be created will be novel climates with new assemblages of local weather. Rather than re-creating a climatic past, the only possibility is to go forward with new sets of conditions in place. The interplay between the material emanations of humanity’s cultural evolution and the physical forces of the non-human world will lead to perpetually improvised climates, climates which are neither stable nor predictable. The weather will always escape such human efforts. Instead, a more humble acceptance is needed of a new improvised and experimental relationship with climate now created. This requires a different understanding of the human relationship with nature. But there is a third imaginative stance which may be taken in relation to the future of climate, one which pushes the idea of improvisation still further. The argument here runs as follows. Human cultures and atmospheric weather are becoming increasingly inseparable. Each is shaping the other in that what humans do shapes the skies overhead, while cultures are weathered through climate. In the Anthropocene, people have moved from symbolically creating their many small worlds to materially co-creating their one entire world. Or rather, their many small symbolic worlds are now embedded within a much larger co-created material world which itself carries cultural symbolism. Historian Dipesh Chakrabarty has argued that one result of Anthropocenic thought is that the historian’s distinction between natural and human histories has begun to collapse. Similarly I argue that the distinction between human and natural climates is no longer meaningful. The central idea of the Anthropocene is that change is now inescapable and perpetual. There is no normal. But this is not merely because natural processes are changing material forms; such has been the case throughout the course of Earth’s deep history. This is because material forms are now increasingly bound-up on a global scale with human processes of discovery, invention and improvisation. In other words, changes in the material world now emerge from the irrepressible human technologies and practices which originate in the cultural imagination. Whether it is human bodies, material technologies, urban ecologies or regional climates … nothing is now merely natural or gifted to the human other than existence itself. Climatic change—i.e., change that is defined by the adjective ‘climatic’—is therefore losing any meaning. Changes occurring to physical climates can no longer be isolated from changes occurring in human economies, technologies, societies and cultures. As offered by Margaret Atwood, “I would rather call [climate-change] the everything change”. ‘Climatic change’ is simply a meta-category of change, an aggregated manifestation of changes which are at one and the same time environmental, economic, technological, social and cultural. In this train of thought, the ‘normal’ historical function of the idea of climate–to stabilise relationships between weather and culture—is now moot. The Anthropocene suggests the possibility of such stability is a chimera. Climate can no longer be helpful as an idea that sits between weather and culture because weather and culture are fusing into a single reality with no independent mediator; we are the weather and the weather is us, an idea played on by Roni Horn in her art project Weather Reports You. Climate is therefore becoming everything, but also nothing. It makes no sense to speak of climate, when the imaginative work performed by the idea of climate no longer has cultural traction. Rather than being useful as an imaginative way of, first, separating weather and culture and, then, of stabilising relationships between them, climate may be in danger of becoming a zombie concept–an idea which is apparently dead, but which continues to ‘live-on’ through its intellectual and imaginative legacy. Metaphorically speaking, the climate of the Anthropocene is becoming climate-less. In this last chapter of Weathered: Cultures of Climate, I have speculated about the future of climate as an idea. I have offered three possibilities. First, and most conventionally, is the idea of climate re-secured within desirable and ‘safe’ limits, of eliminating or at least minimising the effects of human influences on the physical climate of the future. This ambition seeks to shore-up the historical function of climate by re-establishing a degree of orderliness in the world. A second possibility recognises the limitations of this impulse and embraces a future of improvised climates rather than of re-secured or stabilised ones. Improvisation accepts a more humble disposition with regard to the relative powers of the human and non-human world. It nevertheless recognises the inevitability of purposeful human actions re-making the climate, but only within certain limits of possibility. Physical climates will always escape human management. The third possibility is more radical and calls into question the imaginative function of climate upon which this book is premised. In the new era to which the idea of the Anthropocene seeks to give expression, perhaps people will have to learn to live without the idea of climate. At least learn to live without climate as an idea that brings order and stability to relationships between weather and culture. Given my argument that all human cultures are weathered and that scientific investigations show that weather is increasingly being cultivated, new and more fruitful categories than simply ‘climate’ are needed to work with. In the Anthropocene there can be no climate in the old sense. Maybe then, the idea of climate has already served its purpose. Maybe the human condition has outgrown the usefulness of climate as an idea which stabilises and sustains human life. The ‘new normal’ of climate is simply that there can be no normal. And this is unsettling. New concepts and metaphorical ideas, beyond climate, will be needed which meet the emotional, spiritual and material demands of living in an atmosphere and with the weather it yields which, without respite, are now both of human making.